I used to have a Holga (think 4 ,5 years back)and I broke it easily after a roll or 2.. Thus I refrained myself from using plastic cameras for quite some time until I saw this The Black Bird Fly!... Hehe. 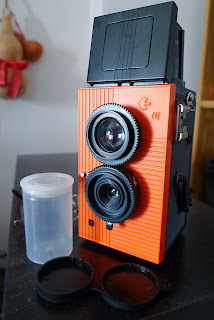 It got delivered last month and I only get to play with it today (yes I'm back in SG) So far the build is pretty good for a plastic camera.. The only think I dun like is the film rewind crank. Feels a bit too easy to snap. Other then that, it sure look cool and retro..
well done bro for the updated map.